A refreshing summer take on the traditional protein pancake, with sweet juicy blueberries exploding with every bite and a soft lemon cream topping. Mix all dry ingredients, then slowly add in wet ingrdients. 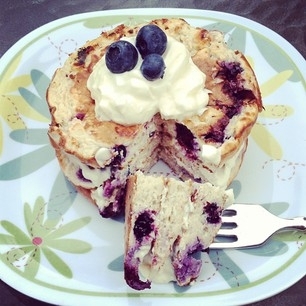 Fold in blueberries and cook like pancakes. For the lemon cream: mix 1/4 cup greek yogurt, 1/2 tsp coconut sugar, 1/2 tsp lemon rind and top the pancakes!